This is a guest article by 47Line Technologies. Last week we introduced Big Data ecosystem and showed a glimpse of the possibilities. This week we take one industry (Retail) use case and illustrate how the various tools can be orchestrated to provide insights. The last couple of decades has seen a tectonic shift in the retail industry. The hawkers and mom and pop stores are being sidelined by heavy weight retail hypermarkets who operate in a complex landscape involving franchisees, JVs and multi partner vendors. In this kind of an environment, try visualizing the inventory, sales, supplier info for thousands of SKUs (Stock Keeping Units) per store and multiply it with the several thousand stores across cities, states and even countries over days, months and years and you will realize the volume of data they would be collecting. One such retail hypermarket, lets say BigRetail had 5-years of data containing vast amounts of semi-structured dataset which they wanted to be analysed for trends and patterns. The 5-year dataset was 13TB in size. Traditional business intelligence (BI) tools works best in the presence of a pre-defined schema. BigRetail dataset was mostly logs which didn’t conform to any specific schema. BigRetail took close to half a day to move the data into their BI systems weekly. They wanted to reduce this time. This is where Hadoop shines in all its glory! As we had seen in the previous post, Apache Sqoop is used to move structured dataset into HDFS. Alas! How do we move semi-structured data? Fret not. 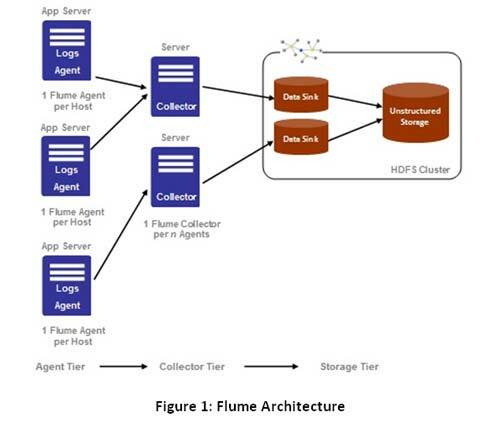 Apache Flume is specially designed for collecting, aggregating, and moving large amounts of log data into HDFS. 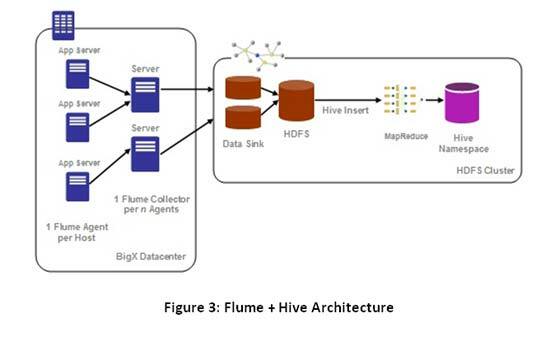 Once the dataset is inside HDFS, Hive was used to perform analysis. Let’s dig deep. Mind you – The devil is in the details. Problem 1: How Flume solved the data transfer problem? The primary use case for Flume is as a logging system that gathers a set of log files on every machine in a cluster and aggregates them to a centralized persistent HDFS store. Flume’s typical dataflow is as follows: A Flume Agent is installed on each node of the cluster that produces log messages. These streams of log messages from every node are then sent to the Flume Collector. The collectors then aggregate the streams into larger streams which can then be efficiently written to a storage tier such as HDFS. Hive uses “Schema on Read” unlike a traditional database which uses “Schema on Write”. Schema on Write implies that a table’s schema is enforced at data load time. If the data being loaded doesn’t conform to the schema, then it is rejected. This mechanism might slow the loading process of the dataset usually, Whereas Schema on Read doesn’t verify the data when it’s loaded, but rather when a query is issued. For this precise reason, once the dataset is in HDFS moving it into Hive controlled namespace is usually instantaneous. Hive can also perform analysis on dataset in HDFS or local storage. But the preferred approach is to move the entire dataset into Hive controlled namespace (default location – hdfs://user/hive/warehouse) to enable additional query optimizations. While reading log files, the simplest recommended approach during Hive table creation is to use a RegexSerDe. It uses regular expression (regex) to serialize/deserialize. It deserializes the data using regex and extracts groups as columns. It can also serialize the row object using a format string. With RegexSerDe all columns have to be strings. Use “CAST (a AS INT)” to convert columns to other types. The merchandise details, user information, time of transaction, area / city / state information, coupon codes (if any) , customer data and other related details were collected and aggregated from various backend servers. flume.event.max.size.bytes uses the default value of 32KB. By default, Hive metadata is usually stored in an embedded Derby database which allows only one user to issue queries. This is not ideal for production purposes. Hence, Hive was configured to use MySQL in this case. Using the Hadoop system, log transfer time was reduced to ~3 hours weekly and querying time also was significantly improved. Only equality joins, inner & outer joins, semi joins and map joins are supported in Hive. Hive does not support join conditions that are not equality conditions as it is very difficult to express such conditions as a MapReduce job. Also, more than two tables can be joined in Hive. Health & Beauty Products saw the highest growth rate at 72%, closely followed by Food Products (65 %) and Entertainment (57.8%). This is just one illustration of the possibilities of Big Data analysis and we will try to cover more in the coming articles. Stay tuned!